This week has been a special week for Melbourne’s very own The Voxel Agents. After more than four years in the making, the team finally released their latest title and first console and PC game The Gardens Between on September 20. So far the game has received an excellent critical reception, with WellPlayed’s very own Kieron Verbrugge scoring the game a 9/10 in his review. As part of our ongoing Made In Australia segment, we spoke with The Voxel Agents’ co-founder and creative director Simon Joslin about the foundations of the studio, the development of The Gardens Between and life in general. You can read The Voxel Agents feature article here. 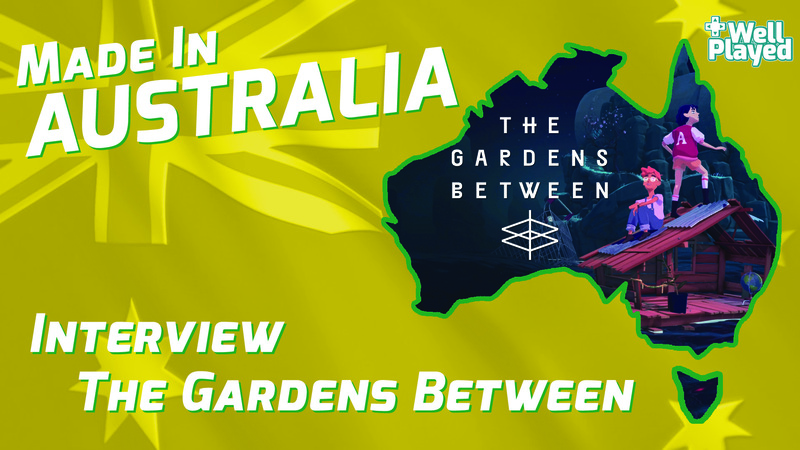 Continuing September’s spotlight on the Melbourne-based studio, we sat down with the game director of The Gardens Between’s and all-around super cool awesome guy Henrik Pettersson on the eve of the game’s launch to find out as much as we can about the Aussie-made puzzler. WellPlayed: In your own words explain what The Gardens Between is all about? Henrik Pettersson: The Gardens Between is a puzzle adventure game where the player takes control of time. Something has happened and two best friends are in distress. They’ve snuck out of their homes and fall into a surreal world made up of their past. In The Gardens Between you get to follow the pair as they revisit their memories leading up to the catalyst event. WP: When did development of The Gardens Between begin? HP: In 2011 we did a series of rapid prototypes. Many of them revolved around the manipulation of time. After I completed Puzzle Retreat in 2013 I went to do some freelancing work. I rejoined The Voxel Agents in 2014 and started putting together a team to flesh out a demo and we made a little puzzle game about Little Red Riding Hood featuring the time mechanic. The little demo was really neat but we really wanted to tell our own original story. I reached out to Narrative Designer Brooke Maggs and that’s where the development of the Gardens Between really started to take shape. WP: How did the idea for the game’s premise come about? HP: Early versions of The Gardens Between were more inspired by Fairy Tales but during development it got more grounded in the real world. Jonathan (Lead Art) and Brooke (Narrative Design) worked very hard building the worlds and how the two spaces, the surreal & the real, were connected. WP: Explain the game’s time control mechanic to us. What is its purpose? How is it used? HP: The time mechanic was the very first thing we developed. In its very early iteration, like the Little Red Riding Hood demo, it was about moving a timeline and finding hidden objects. It works well in narrative-driven games as players are encouraged to explore important moments. During the Development of The Gardens Between we pushed the concept further with several timelines overlapping and interacting. It’s sounds complex but we found it to be pretty intuitive, and a fun way to engage with a virtual world. WP: What sort of emotions are you hoping players will feel when they play TGB? HP: We wanted to tell an honest story with The Gardens Between, something that stood in contrast to the high octane optimism common in western storytelling where the individual’s choice is in focus. We wanted to make a story about events we have no control over, upsetting as they may be, is a true part of life. WP: What sort of resolution does the game run at? HP: Switch: 1080p on switch docked. 720p handheld. WP: The game’s characters progress through reliving childhood memories, are any of these memories from your own childhood? HP: Yes, they take a lot of inspiration from it our own stories. During our narrative discussion we tried to break down why certain events from our childhood stood out. There would be a lot of recurring experiences like the sleepover, making a secret club and playing lots of Nintendo games. WP: In the game Arina and Frendt don’t appear to speak. Why is this? HP: The Gardens Between is a story told without words or dialogue. That means the narrative is told through visuals and audio. This was part of the vision early, it lets the player insert themselves into the empty space. WP: Levels are played out on smallish islands. How varied will the levels be? HP: Most puzzles are solved within the confined space of the islands you’ve seen, and the main goal is always the same: Find the ‘light’, bring it to the Beacon. We always try to vary up the layout and make the spaces feel unique. WP: Did you ever have any plans to make the game a cooperative experience? HP: It’s designed as a single-player game. We would have to re-think how the time mechanic would work as a cooperative game. It’s not impossible but it would be quite different. WP: TGB features some beautiful artwork. What inspired having this art style? HP: Jonathan (Lead Artist) and I would bond over our shared love of Japanese culture and art. The spaces take a lot of composition rules from Japanese garden design and Jon has also mentioned contemporary illustrations as an inspiration. I also think the type of story we’re telling lends itself to a particular style. Many people mention Studio Ghibli when they look at our game. The story that you find in those film deals with similar subject matter. WP: How hard is it to design puzzles in a game like this? Do you have a lead person for puzzle design or is it a collaborative effort? HP: I’m usually the person that does the early concepts for the puzzles. But after that it requires so much backwards and forwards between the other team members and before it’s done every member has contributed to the puzzles. That requires a lot of communication and cooperation. That is one of the big challenge when you try to make a game that intersects gameplay and narrative seamlessly. WP: Are there any plans to sell art prints or vinyl soundtracks from the game? Because I would buy those…just saying. HP: Haha, yes. it’s in the works. I can’t promise anything at the moment but it’s definitely the wishes of the team. WP: The game’s been at a lot of trade shows and events in the last few years, what are some of the lessons you’ve learned from those? Has there been feedback that’s actually changed any part of the game? HP: Yeah absolutely. Trade shows like PAX or Gamescom are like a big playtesting session and that has a major role on how we prioritize our work. “Is this puzzle working” “Why are the players getting confused here” etc. We’ve also got better at pitching our game. On the show floor we’re repeatedly asked what our game is about. When asked that question, maybe 100 times, we start to understand what people respond well to. That description often becomes the taglines on the store pages like Steam. WP: You’ve also won and been nominated for a ton of awards. That must give the team a lot of confidence? HP: Absolutely, we’ve been super honoured by the selections and nominations. During development, when we’re deep in it, it’s really hard to see the bigger picture of what’s being made. Getting that recognition, besides the absolute joy, is also affirmation that things are going in the right direction. WP: How many levels/puzzles are currently in the game and do you have plans to add more content post-release? HP: There are around 21 ‘Gardens’ in the game, each featuring several puzzles. The game takes anywhere between two to five hours to complete depending on how confident you are with puzzles and whether you engage with the environment and the passive storytelling. At the moment there are no plans for any additional content. Post-launch most of the team is going to take a long holiday. WP: You’ve got Tim Shiel doing the soundtrack for TGB, what was that working relationship like? Was it a case of him just producing some music to use in the background of the game or was he involved in the entire process? HP: Working with Tim was like a dream. He was involved from the very start. We would share playlists and talk about the mood and tone. Because of how we’re telling the story in The Gardens Between I think having him on board from the beginning was an absolute necessity. WP: I’m interested, what do you think your audience for this game is? Who do you see playing these kind of softer, more meditative experiences? HP: I think in general people who enjoy puzzles and adventure games are going to really enjoy The Gardens Between. As mentioned, a lot of the storytelling in the game is passive. The player needs to put the pieces of the narrative together themselves. Players who want more action and race through the game are still going to enjoy the art and the puzzles but maybe not get as much from the experience as the player who explores. WP: Thank you for your time and enjoy your holidays. We can’t wait to see what’s next from The Voxel Agents.